Barley, where it succeeds, yields a larger weight of feed per acre than any other small grain crop. Buckwheat may be planted later than any similar crop, and often does well on old meadows or waste land that can be broken after the more exacting crops are planted. By the immediate preservation of eggs for home consumption through the use of water glass or lime water, larger supplies of fresh eggs may be made available for marketing later in the season, when production is less and prices higher. Corn is the leading food and feed crop of the United States in geographic range of production, acreage, and quantity of product. The vital importance of a large acreage of this crop, properly cared for, therefore, is obvious. For the Gulf States, perhaps no forage crop of which the available seed supply is relatively abundant exceeds the velvet bean in potential value. This legume possesses also the ability to make a crop when planted relatively late. In the southern half of the country perhaps no crop has larger possibilities for quick increase of production of food for both men and animals than the sweet potato. One could drive a prairie schooner through any part of his argument and never scrape against a fact. Rice at present prices provides more food for the money than most of the other cereals. The ease with which barley may be substituted directly for wheat in human food and its usefulness to replace wheat milling by-products as feed in the production of the milk supply render its abundant production important. The high food value of field beans and the shortage of supply due to the light yields of 1915 and 1916 render them of great importance in the regions to which they are adapted. The importance to the nation of a generously adequate food supply for the coming year cannot be overemphasized, in view of the economic problems which may arise as a result of the entrance of the United States into the war. The most effective step that may be taken to increase the production of these crops is to enlarge the acreage devoted to them in the regions where they are grown habitually. The older, thinner, and less productive grass lands, however, frequently can be made to produce much larger yields of feed in corn than if left, as they are, in unproductive grass. The soy-bean, in particular, has proved sufficiently resistant to cold in spring and to adverse weather during summer to warrant heavy planting, especially throughout the South. The usefulness of cow-peas and soy-beans as human food has been recognized only recently in this country. The value of the beans for oil production, as well as for human food, has become recognized so quickly and so generally during the past year that the crop has acquired a commercial standing far in excess of its previous status. What this loss means will be appreciated from the statement that one bushel of wheat contains sufficient energy to support the average working man for 15 days. David Franklin Houston was born in Monroe, North Carolina. He was an American academic, businessman and democratic politician. He served under President Wilson as the 5th Secretary of Agriculture and the 48th United States Secretary of the Treasury. He graduated from the University of South Carolina in 1887 and did graduate work at Harvard University, where he received a M.A. in political science in 1892. He taught political science at University of Texas. 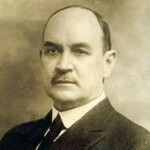 He then became president of the Agricultural and Mechanical College of Texas from 1902 until 1905. Houston left Texas to serve as chancellor of Washington University in St. Louis, a position he held from 1908 to 1913. After leaving the U.S. federal government, Houston became as the president of the Bell Telephone Securities and a vice president at AT&T. He was president of the Mutual Life Insurance Company of New York for ten years.